Holman # 1-- Luman Holman was a major timber dealer with a huge lumber yard at Jacksonville, Texas. I first went to his place to buy cattle in 1975. It was a time when you could buy most pairs in Texas for $400 and pick the herd. The Holman herd was a very mixed bag. Prior to my visit he had spent time collecting TL cattle from the major herds of that time. He had bought about a dozen cows from Walter Scott which were mixes of mostly Peeler breeding, several had a lot of high horn and extra skin. 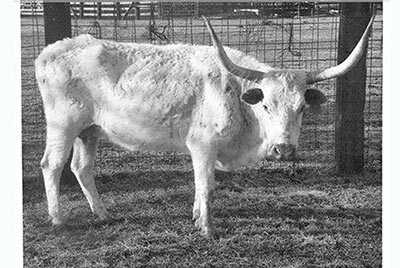 Holman had bought about a dozen heifers from the Wichita Refuge herd and by 1975 most of them were 6 or 8 years. But, my main interest was his Butler blood which he had bought directly from Milby Butler. He had bought about 6 Butler cows and had two sons from those cows registered as Holman B1 and Holman B6. The Holman herd was multiple sire with a zorro free-for-all when a cow cycled. The herd had about 50 adult females and maybe 20 breeding age bulls all mixed in. Due to the better value of Butler cattle and lesser value of Scott cattle, most were registered as straight Butler and I never heard of any registered to the Scott blood. He would let me pick what I liked best except about 3 Butler cows. It was early spring and some had calves. All were very poor. I selected a black pinto WR branded cow, a cow registered as Holman 47 who appeared mostly WR breeding, 2 white Butler females and another 3 or 4 to fill the trailer. I had a 6' X 20' Hale trailer I had traded cattle to Ray Moore for. Later I registered the best calf from those cows as El Patron who is TLBAA AI #30. Most thought he was all Butler. I wanted the old Holman #1 cow, but she was poor and looked barren. I had been trained by some old cattlemen that young Colorado TL buyers could get caught up on horn and spend hard money to get cows that never ever calved again. I had bought some barren ones and some full of liver flukes and lost money every time. After some costly lessons I learned to preg check cows, palpate ovaries and try to protect myself from expensive mistakes. I ask Mr. Holman if I could put her in his chute and examine her. Her ovaries were like tiny historic stones. She certainly was not pregnant either. Mr. Holman didn't believe me so I gave him a clean glove from my brief case and he explored her innards himself, finally agreeing. I have no clue what he thought he found? I turned her down. When I found a pocket of Butler cattle it just so happened that Red McCombs would also find the same herds. When Red saw Holman #1 he didn't have a plastic glove, bought her and sent her directly to Rio Vista Embryo lab. I would have given him a zero chance of success, but when she was wormed, fed well and pumped full of super ovulation shots she finally produced one embryo and a son. The bull Classic was the most popular of any bull ever in the TL breed. He had 60" horn T2T, was white and sired white cows out of everything. I would have never bred Classic to Holman #1, but Red did, and as a result, the bright spotted bull Don Juan of Christine was born. Then he sired Coach, and the rest is history. According to the Arrow Head Cattle Co site, Coach is the second leading sire of over 80" females, a total of 7. The next time I went to Mr. Holmans the Holman B1 bull had died and he gave me the skull. I loaned the skull to the Butler Museum. Now you know that little piece of history.